« Is it hard to become an Android developer…? So how is it going now...? My income got a little steady. This happed because I have been moving to new house and had very little time to work on all my projects. So it is not growing so rapidly anymore. Anyway there is still one amazing thing! I have been working just a little to keep the things going and I still made quite a nice income! Not bad for an income in "lazy month". I have not started any new project and all income has been generated from my currently running websites and applications. All work involved was just maintaining the websites with a few updates and fixing some bugs in my applications. So in total I have earned ...[PLEASE LOG IN TO READ]... more than I have been making in a day job (in Poland)! I have started working on another Android application and I am going to make an Android my main income source. Unfortunately I am not allowed to add paid application to Android Market but as you may see the free ones can make a steady income as well. Moreover I am slowly outsourcing some of my projects (updates and content creation) via Freelancer.com (of course I will never outsource my personal blog). Outsourcing lets me keep working on things that bring real money (Android development) and not loose a lower income sources. Would you believe that you may outsource a monthly niche blog updates for as low as $30 (much more regular than I used to do personally!)? So in coming weeks I am going to get rid of all work that is caused by smaller projects (thanks to Freelancer.com) and to focus on my main income source stream (Android). Moreover I am going to spend a lot more time working to grow my income and to make it really steady. Just wish me luck! Hi Chris. I’ve been reading your blog for 2 months now and all I can say is WELL DONE SIR! You have motivated me to try to do something similar myself. Wish you all the best with Android development. Thanks! Good luck for you too! Thanks for sharing and good luck with your Android apps! Keep up the good work. You embody the best of entrepreneurship! Not scared, open and aiming at the achievable with potential to get big later! What ad provider are you using within your Android app(s). How many users of the app? I would like to know the same thing: which ad provider? how many user per app ? How many applications? I expect these earnings to be shared by several applications. Can you tell us the titles? And, how long did it take to develop them ? I wouldn’t advice you to give up your day job. I’ve been using mobile advertising for over 2 years now and never thought about leaving my day job. There is only one reason for that. You are relying on 3rd party companies like Admob, Inmobi etc which can cut your income source with one click. Although it may be unlikely for your advertisers to close/freeze your account it is possible. It’s also possible for your employer to fire you with one decision. Kreci is in a much better position to build several income streams full time. Relying on one passive Android income source for a while is not that risky in the grand scheme of things. Well done, Kreci, rock on! VERY impressive. I didn’t know that was possible! Now I’m thinking of writing an app or two! Nice work man. Can I ask for any tips involving selling illustrations or photography on iStockphoto? Is it worth it ? How many photos do you have online ? Click on the link in the article to see my portfolio. It should answer your questions. Looking good. It’s fortunate that you can earn a great living developing on your own in your country. Unfortunately, It is pretty much poverty level here in the United States. I make ~$75k / year. But our cost of living is very expensive here so there is that to take into consideration. Well done. Thanks for the info, sounds very promising. It is too bad that it is what most high-school students make at part-time jobs in the US/Canada. This strategy is not a viable one here. What jobs are high school students working part time and making that much? You would have to make approximately $14.38 an hour working full time to make that much, or $28.75 an hour part time. Depending on what your average expenses are and where you live this amountper month is incredibly tough to live on, especially if you have kids, but its not impossible. Sweet. Don’t forget to pay tax! Curious what ppc site you use to make that kind of coin every month? Do you put a lot of effort into them? I am stunned that you can make so much from iStockPhoto. And you don’t really even have all that many photos either. Can you expand a bit on your iStockPhoto process? Is there a lot of photoshopping involved? Do you know what photos you are going for or take a photo of whatever? I prepare most of my shots and I make photos of things that may be useful for advertisers/publishers. But sometimes I just get my camera outside and shot a few photos (this one is very popular and done during one of my bike trips: Giant Pipes ). That’s a nice shot. Are you using a DSLR? Yes – Canon EOS 400D (In USA known as Canon Rebel). Do you post-process your photos in photoshop? If yes, what kind of effects do you add to have a “cleaner” look? I don’t know anything about photoshop, but might as well give this things a try. Thanks for this post, you are an inspiration! I’ve also quit my job in order to write Android apps and web startups. I’ve made all of about $2 in the last 2 months off my one not-that-popular Android app (a few thousand impressions). I still believe that ad revenue is not real revenue – you need millions of impressions a month to make a somewhat acceptable income, and those kind of impressions only happen for a few Angry Birds-type of successes. Still, there are many other ways to make income from apps (like subscription, affiliate links, etc), so I’ll keep trying. All that said though, I would be happy to get the kind of revenue you’re getting as I live very frugally. It would free me up to chase after bigger stuff. hey man! you are my hope! :) good luck! I appreciate your work and this is an amazing report. It gives me inspiration and motivation to develop Android application. In fact your blog has inspired me to learn android app development. Thanks a lot Chris. I’d like to ask a simple question. How many apps do I require to develop, with how many impressions (approx)/day to earn at least $100/day? Well done KreCi. What you earn isn’t to be sneered at, even in a more expensive country like the US. Sure, it might not be twice your day job salary but nonetheless, it is a substantial amount that means you will not go hungry. I’m looking forward to your next income report and good luck with your next Android app. Well done KreCi and thanks for posting these updates. I am planning to create a website for education, and am hoping to make use of affiliates and other revenue generating streams for generating revenues. Your income reports have been very useful to me. You have inspired me to start trying to do the same thing. No I have not tried oDesk. I am active user on Freelancer.com. hey thats a great report Kreci…! All the best for your new Android Application. Will keep visiting and commenting on the blog. You inspired me. I see android application development as a second source of income – but a good idea. 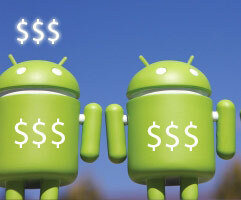 More and more people write about how to make money by creating Android applications. I have started to be seriously interested in this some time ago. From what I have noticed a lot of you can even make money, not earn as much as Apple developers but the money that you earn can be a nice injection of home financial budget. Several things are needed to increase your income. The first is the original idea for an application, the second issue is the accuracy of its implementation and the third but not last then you really have a lot of free time to implement it, if you’re working full time is hard to perform. In any event, good to know that there is more and more people who not only treat the creation of android applications as an additional job but as a major source of income. The amounts that earned Chris in his country are completely satisfactory and allow to live at medium level. The most important that you do what you want and not what you need:). We are waiting for new report Kreci:)..
waiting for new report, KreCi.